The Society for Immunotherapy of Cancer (SITC) is pleased to present scientific highlights from the Nov. 11, 2018, sessions of the 33rd Annual Meeting. 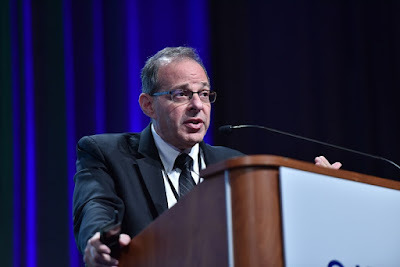 Roger Cohen, MD (Abramson Cancer Center, Philadelphia, PA, USA), reported on a phase 1b/2 clinical trial (NCT02643550) evaluating the safety and efficacy of anti-NKG2A monalizumab in combination with cetuximab in patients who have received prior systemic therapy for recurrent and/or metastatic squamous cell carcinoma of the head and neck (R/M SCCHN). As of August 31, 2018, 40 total patients were enrolled (Progressive disease after platinum, 75 percent are HPV negative, 43 percent prior IO therapy, 33 percent are IO resistant) and received monalizumab (10 mg/kg Q2W) in combination with cetuximab (400 mg/m2). Median overall survival (OS) was 10.3 months and 12.8 months in IO naïve (n=23) and prior IO patients (n=17), respectively. Median progression-free survival (PFS) was 4.0 months and 5.0 months in IO naïve and prior IO patients, respectively. Overall response rate (ORR) was 27.5 percent (95 percent CI, 16.1-42.8) in all patients with one confirmed complete response (CR) and ten confirmed partial responses (PR). Responses to therapy were observed in both IO naïve (35 percent [95 percent CI: 19 – 55]) and IO pretreated patients (18 percent [95 percent CI: 6 – 41]). Median duration of response (DOR) was 5.6 months (95 percent CI: 3.8 – not yet reached). Combination-related adverse events (AEs) were mostly grade 1-2. Only one patient required cessation of treatment secondary to treatment related toxicity, with no observed potentiation of cetuximab-related AEs. Additionally, stromal NK cell and tumor CD8+ T cell infiltration was observed 15 days after first administration of combination treatment in all responding patients. Together, these data suggest combination monalizumab and cetuximab is safe and may be effective in treating patients with both IO naïve and IO pretreated R/M SCCHN. Miguel Gaspar, PhD (F-star Biotechnology, Cambridge, UK), described the anti-tumor activity of FS120 mAb2 – a bi-specific antibody that targets the co-stimulatory tumor necrosis factor receptor (TNFR) superfamily receptors OX40 and CD137. OX40 and CD137 are expressed on CD4+ and CD8+ T cells as well as NK cells, suggesting that the ligation of the receptors may help activate various types of immune cells. However, FcγR-mediated crosslinking is also necessary for monoclonal antibodies to induce receptor clustering and immune activation. To overcome this issue, FS120 mAb2 was generated by introducing an OX40-binding site into the Fc-region of a human IgG1 targeting CD137. Data indicate FS120 mAb2 concurrently binds to OX40 and CD137 in pre-clinical models with subnanomolar affinity and stimulates both CD4+ and CD8+ T cells in the absence of FcγR crosslinking. FS120 mAb2 demonstrated increased anti-tumor activity than a combination of OX40 and CD137 monoclonal antibodies in the CT26 mouse tumor model (p less than 0.00001). In addition, doses as low as 1 mg/kg of FS120 mAb2 induced peripheral T cell activation and proliferation without regulatory T cell depletion in CT26 and B16-F10 syngeneic models. Together, these data suggest that FS120 mAb2 can stimulate both CD4+ and CD8+ T cells, mediating potent FcγR-independent anti-tumor activity, and support initiation of future clinical development. Li Peng, PhD (Palleon Pharmaceuticals, Waltham, MA, USA), presented research describing EAGLE (enzyme-antibody glycan-ligand editing) - a novel multi-functional antibody-like molecule that inhibits the glyco-immune checkpoint axis by selectively removing the terminal sialic acids of sialoglycans on tumor cells. Recent data suggest that the glyco-immune checkpoint axis (sialoglycan/Siglec pathway) may serve as a target to alter immunity within tumor microenvironment. Ligation of sialylated glycans to ITIM (immune receptor tyrosine-based inhibitory motif)-containing Siglecs on immune cells regulates functions of macrophages, monocytes, dendritic cells, T cells, and NK cells. In this study, multiple EAGLE variants were shown to reduce tumor growth in mice bearing EMT6-Her2 syngeneic subcutaneous/orthotopic breast cancer tumors, achieving 7/24 CR. Further experiments revealed that EAGLE treatment decreased sialic acid levels on tumor cells, leading to increased immune cell infiltration and activation as well as induction of anti-tumor immunological memory. EAGLE pre-clinical efficacy was reduced by depletion of NK cells, macrophage, and CD8+ T cells. Interestingly, treatment with EAGLE or the combination of anti-PD-1 and anti-CTLA4 achieved similar anti-tumor activity in mice bearing the “cold” poorly immunogenic B16D5-Her2 tumor model. Importantly, EAGLE + anti-PD-1 was more effective at eradicating tumors than the respective monotherapies (6/6 CR = EAGLE + anti-PD-1, 3/6 CR = EAGLE, 2/6 = anti-PD-1). These data demonstrate pre-clinical efficacy of EAGLE as a monotherapy and in combination with anti-PD-1, and suggest that EAGLE may favor induce immunity against “cold” tumors. David Richards, PhD (Apogenix AG, Heidelberg, Germany), presented data detailing the effects of HERA-GITRL - a hexavalent human glucocorticoid-induced tumor necrosis factor receptor (TNFR) ligand fusion protein - to increase T cell stimulation and subsequent anti-tumor activity. Pre-clinical data indicate that agonizing the TNFR super family member GITR can induce anti-tumor T cell activation and may be a promising cancer immunotherapy strategy. HERA-GITRL is composed of a trivalent single chain GITRL-receptor-binding-domain fused to an IgG1-derived silenced Fc-domain that serves as a multimerization scaffold. In vitro analyses showed that HERA-GITRL increases activation, maturation, and proliferation of CD4+ and CD8+ T cells, naïve and memory T cells, without affecting regulatory T cells (Tregs), and can prevent Treg-mediated suppression. In pre-clinical in vivo antigen-specific adoptive transfer assays, surrogate murine HERA-GITRL (5 mg/kg) increased expansion of antigen-specific CD4+ and CD8+ T cell populations compared to control treatment (CD8+ = 3.5 percent vs 1.3 percent; CD4+ = 4.2 percent vs 2 percent), and did not stimulate non-specific immune cell expansion. Treatment of CT26 cancer models with HERA-GITRL (1mg) reduced tumor growth compared to placebo. HERA-GITRL-mediated T cell activation enhanced tumor cell killing independent of Fc functionality in vitro as well as in humanized mouse models. These pre-clinical data suggest that HERA-GITRL may be able to enhance antigen-specific T cell activity and anti-tumor efficacy.